java.util.Timer is a utility class that can be used to schedule a thread to be executed at certain time in future. Java Timer class can be used to schedule a task to be run one-time or to be run at regular intervals. java.util.TimerTask is an abstract class that implements Runnable interface and we need to extend this class to create our own TimerTask that can be scheduled using java Timer class. Timer object will keep adding tasks to the queue and as soon as one thread is finished, it will notify the queue and another thread will start executing. Timer class uses Object wait and notify methods to schedule the tasks. TimerTask is an abstract class and we inherit it to provide concrete implementation. TimerTask class implements Runnable interface so it is a thread and hence your implementation of TimerTask is also a thread. Very simple Timer and TimerTask Example: Task executes once 5 seconds have passed. Task scheduled.. Now wait for 5 sec to see next message.. Implement a custom subclass of TimerTask. The run method contains the code that performs the task. In this example, the subclass is named CrunchifyReminder. Create a thread by instantiating the Timer class. 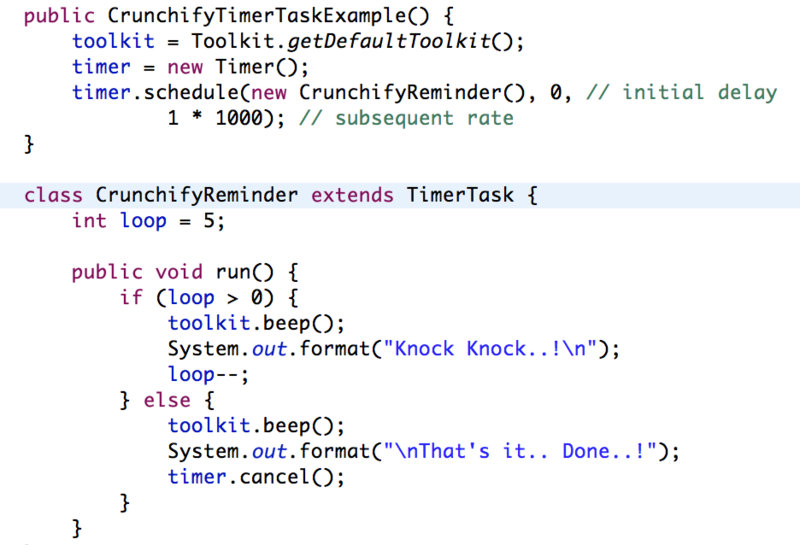 Instantiate the TimerTask object (new CrunchifyReminder()). Schedule the timer task for execution. How can I perform this TimerTask Repeatedly? Invoke cancel on the timer. You can do this from anywhere in the program, such as from a timer task’s run method. Make the timer’s thread a “daemon” by creating the timer like this: new Timer(true). If the only threads left in the program are daemon threads, the program exits. After all the timer’s scheduled tasks have finished executing, remove all references to the Timer object. Eventually, the timer’s thread will terminate. Invoke the System.exit method, which makes the entire program (and all its threads) exit.